Take all ingredients,expect oil, mix well. Make equal balls & keep it aside. With all purpose flour or gram flour , dust the balls & deep fry until golden brown. Heat oil in a pan, add cumin seed, chopped onion,ginger garlic paste & saute few mins. Add all powders ,tomatoes cook until all raw flovours extracts. Allow to cool & make a fine paste. Heat the pan , add ground paste & allow to boil. Add cashew paste & double cream. Allow to boil & Check the seasoning. Arrange the kofta in vessel & add malai gravy. Garnish with cilantro & serve hot with paratha or rice. Kofta Curry looks sinful Sri! yummy yumm..
Malai kofta looks well done, koftas in gravy look very rich :) nice pics with good finishing. I have not seen this kind of kofta before and it sounds great. 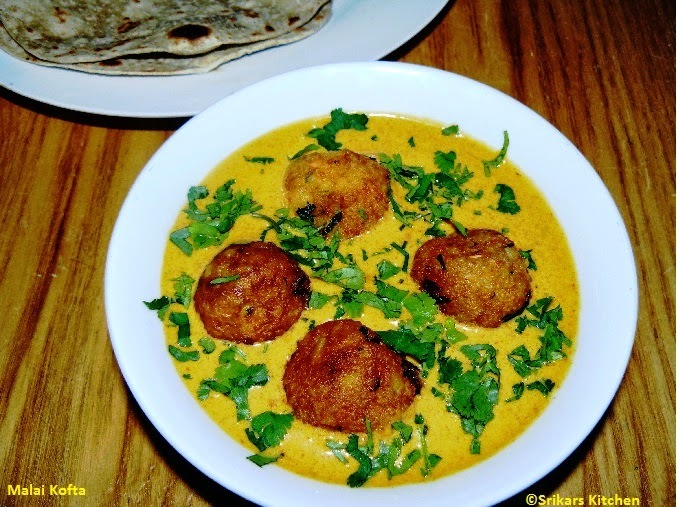 Wow, Malai Kofta looks absolutely rich and delicious Sri!!! Its soo yummy and looking rich and delicious..can have some ?? Rich and spicy kofta...Great take with color. Yum yum. Too good Priya. these are my absolute favorite, but i dont add peas, they look simply divine! WOW that looks so creamy delicious. That looks rich and creamy! This is one of my fav curry..Looks so yummy and very tempting. Looks so rich and I have never tried before! Thanks for the recipe! Looks so creamy and delicious! Koftas came out perfect! wow... looks sooo rich and creamy.. un samayal pathi sollanuma? kalakuva nee. Kofta curry makes me drool. Superb. Beautiful! Looks very nice and rich...Love this with some Naan! Wow...this looks so delcious. looks rich and fantastic.